กากๆ /gàak-gàak/ is used to say to a person who is useless, never done something useful. เกรียน /grian/ is used to called a person who always annoyed other people verbally. These four words mean the same thing which is ‘do something to to the utmost’ , do something with all one’s might or capability. โนเวย์เสตชั่น /no way sà-dtay-chân/ is the answer ‘no way!’ like in English. 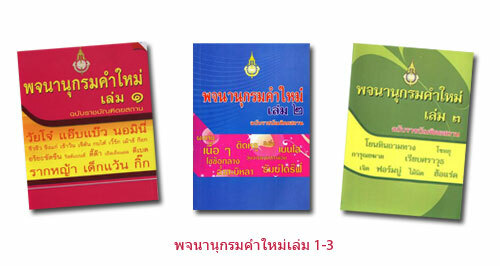 “ชัวร์ป้าบ/chua bpâap/ means ‘absolutely sure’ , the words ชัวร์/chua/ is borrowed from English. อาหารไทยอร่อยขั้นเทพเลย /aa-hăan tai à-ròi kân tâpe leoi/ Thai food is very delicious. ฝีมือถ่ายรูปของเค้าขั้นเทพ / fěe-mue tàai-rûup kŏrng káo kân tâpe/ His photography skill is awesome! Is it very embarrassing? He has been in Thailand for 10 years, but he still can’t speak Thai. หน้าของเค้าเหมือนพี่ของเค้าเดี๊ยะ /nâa krng káo mŭean pîi kŏrng káo día/ his face looks exactly the same as his older brother. Have you heard of these words before? Thanks for the tips. 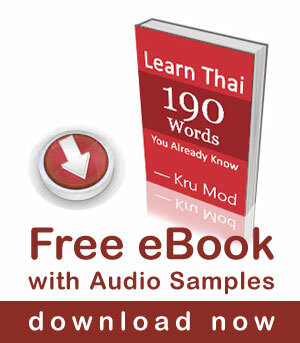 Now we can learn to speak Thai language as it is spoken by real Thai people! PS Sorry for the late reply, but your video arrived only yesterday. There is a spelling mistake here: “อาหารไทยอร่อยขั้นเทพเลย”. Should be “อาหารไทอร่อยขั้นเทพเลย” I think. You mentioned that you did not know what “kon Kean stand up” might be in English. Thanks a lot for those informations.I think this commitee is pretty useful for the entire people of a country .Organisation like that are missing in Europe.I think that the knowledge of all these words will be useful for my next trip in khrung Thep next month. Khoob Khoun mak khrab . Used dtáeng-gîu lăai today and got a laugh. It’s amazing how much you learn when you have someone to practice with every day. yang mee bpan haa gap awk siiang. This is one language that requires a concentrated effort to pronounce. If I become khee khiiat kao jai pom mai mee krai.